Raffaella Stroik was found over 115 miles from St. Louis. College of Arts and Sciences employees made up almost 44 percent of the total contributions reported. The duo brought more than just doses and mimosas Thursday night. Three music scholars offered solutions to discovering female-based hip-hop music. Herman B Wells was the 11th president of IU and is known as one of the most influential presidents in the University's history. IU faculty and alumni have earned a collective nine Nobel prizes — two in economic sciences, two in physics and five in physiology or medicine. IU has had many accomplished alumni, here is a list of eight you may not have known. The plan outlines possible changes such as Kirkwood Avenue becoming a new curbless, shared street. Big Dipper anticipates his newest album to be out late this summer. Most credit the Babylonians with the discovery of astrology, according to the American Federation of Astrology. Can you guess these celebrities' sun signs? Try to take a guess at these celebrities' sun signs. The Little 500 is here. The Indiana Daily Student compiled a race guide with everything you need to know, including team rosters, feature stories, photos and more. Russian officials have expelled 60 U.S. diplomats. 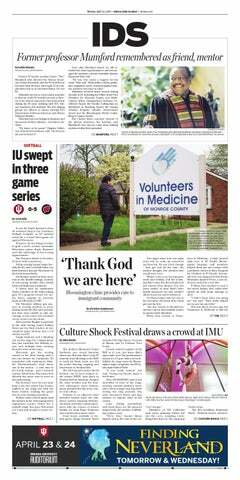 The IDS takes a look at Clery reports from the Big 10. A round up of TKE chapters that have closed. Here are the biggest stories we brought you this semester. New "Evanescence" album fails to impress. Here are the major universities that have suspended greek life activities this year. The 299 acres of Yellowwood State Forest was auctioned off Thursday morning for just over $108,000.